The A-Body platform represented Dodge and Plymouth’s compact segment between 1960 and 1976. 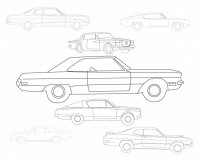 Not to be outdone by larger sedans, these diminutive models were wolves in sheep’s clothing, their most powerful models hiding high-performance engines from the 340 small block to the 383 and big blocks. 1968 models even had the option box for the mighty 426 Hemi engine.